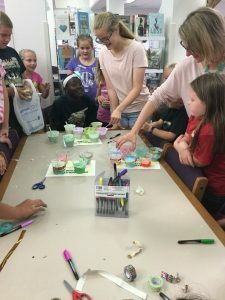 We had slime night on Wednesday and sadly, it was my last event as an intern at the library. About thirty kids came to the event which was definitely the largest group of kids at any of the events that I attended. We had two different slime recipes for everyone to choose between. One was glue, water, and detergent, and the other recipe was glue, baking soda, and contact solution. When they were done, they could put food coloring, shaving cream, baby oil, essential oils, flour, or sequins into their slime. After their slime was made, the kids decorated their slime cups. There were three contests to enter their finished slime into: the prettiest slime, the grossest slime, and the best sounding slime. A lot of the slimes turned out really well, and I think that the kids had a lot of fun. I had a lot of fun interning at the library this summer. My favorite part was planning activities and decorating for them. I really enjoyed working with the SAC kids at the passport club. I think that this has been a really great experience for me and will be benificial to my future jobs and eventually my career. I enjoyed working with all of the library staff and and the kids who came to the events. I am thankful for the opportunity this internship gave to get work experience and hope that future interns at the library will have as great of a summer as I had. Everyone is busy creating the best slime they can. As you can see, the room was crowded, since the “Slime Night” was a popular event. 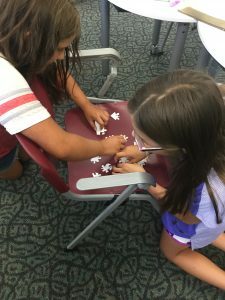 On Friday, we held an escape room at the library. This was the first activity that I planned during my internship, and it turned out great. The escape room theme was crazy librarian, so there were cat pictures hung everywhere, and her desk was a mess. “Escape Room” participants working on solving a puzzle. How it worked was we gave the kids one hour to open a locked box with a prize inside. To get the key for the box, they had to use the clues in three smaller locked boxes. And then everyone had to look around the library and her desk for the combinations to the three small boxes. It was hard to judge how hard some things would be for them to figure out, so we gave them three chances to ask for a clue from Ashley and me. When they couldn’t solve the puzzle, they would split up so a few would look around for the next puzzle and a few would keep working on it. Sometimes, the group would bypass the first puzzle and find the next one without the clue that the first one would have provided. They were so close to getting the prize out of the box within the hour. They only went 30 seconds over so we let them have the candy anyway. 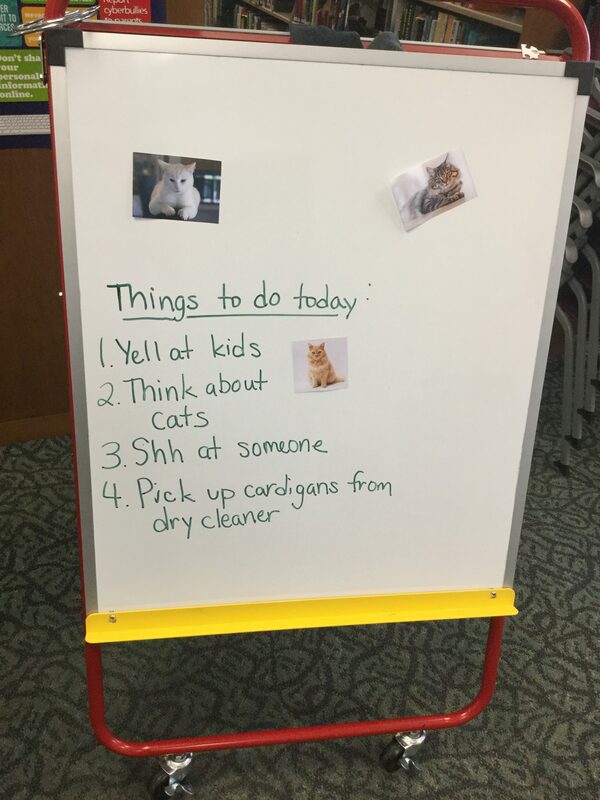 The Crazy Librarian’s to-do list for the day. The SAC kids visited China this week. We started by making a KWL (what do we know, what do we want to know, and what did we learn) chart. Then we read Project Panda, a story about a boy visiting China and finding a lost panda. After that, we watched a video about pandas and their diet. The video and the book helped us fill in the W for what we want to know. Next, we watched a video of a picture book called Sam and the Lucky Money. It told the story of Sam and how he spent the lucky money his grandparents gave him for New Year. When we were done reading, the kids took turns making spicy noodles, a panda craft, and looking at a picture book. To end the very last passport club, we went outside and played catch the dragon’s tail. It is a traditional Chinese game played by many children in China where the kids line up and the person in the front of the line tries to tag the last person in line. The kids in the middle curve the line to stop the front from tagging the back. We split them into groups and they ran around until the club was over. The passport club visited Cuba this week. We started by learning what culture is and then we talked about some examples of Cuban culture. Then we read Martina the Beautiful Cockroach. It was about a cockroach’s search for true love. Then we read All the Way to Havana, which was about a family living in Cuba with an old car and their struggle to get it running every morning. We took a break from reading and the kids split into 2 groups. 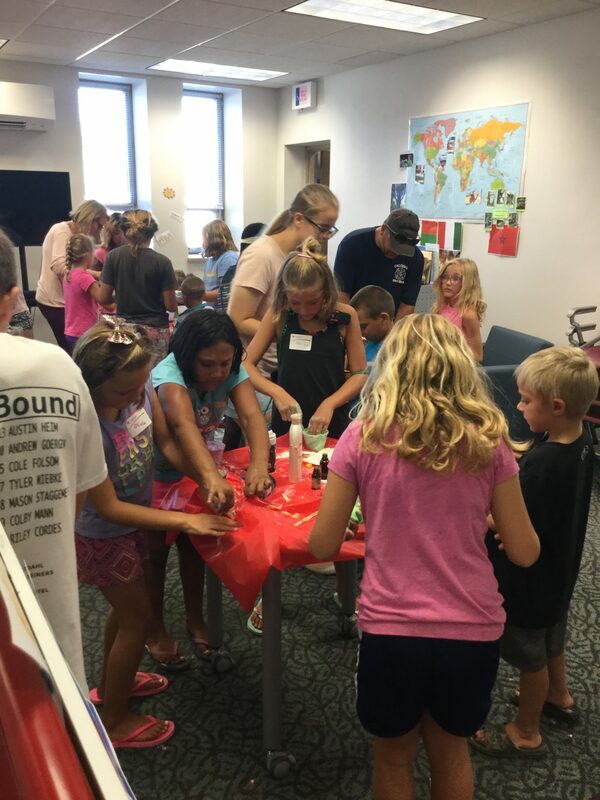 The first group decorated maracas and the second group made Elena Ruz sandwiches. They are traditional Cuban tea sandwiches made by spreading jam and cream cheese on bread with turkey in between. After the groups switched, I read a book called Señor Cat’s Romance. We finished out the club by asking the kids what they learned about Cuba. Then they grabbed their maracas and we said goodbye. This week, the passport club traveled to Turkey. We read the book The Hungry Coat which taught us not to judge a book by its cover. Then the kids got some clay and molded an evil eye charm take home. They started by rolling a flat circle of white clay. Then they made a smaller blue circle, and an even smaller black circle. They stacked the clay up to look like an eye and gave it to Ashley to bake. Some kids got really creative and mixed the colors together. After that we read a nonfiction book about Turkey. 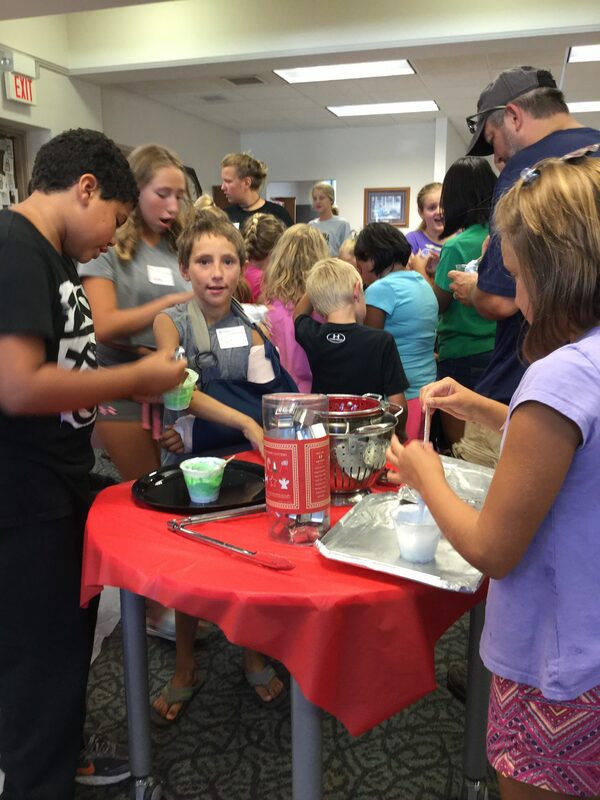 Then the kids split into groups and helped make hummus. 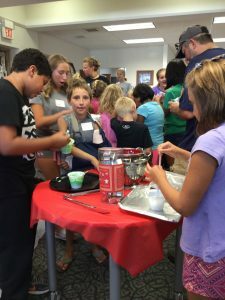 Three groups helped peal chickpeas and the fourth group added spices and lemon juice to the chickpeas in a food processor. The kids all got to try the hummus with pita chips. While they ate the hummus, Ashley read The Elephant and the Mouse which was about a very confident mouse thinking he was stronger than the elephant. Before everyone left, we tried rice pudding. Everyone had a lot of fun.